I know I've mentioned this before, but I absolutely love Jello recipes. This beautiful pastel jello mold is a wonderful potluck dish for a Mardi Gras party, and would be perfect for Easter as well. Adding sour cream to each mixture mellows out the flavor a bit and creates those gorgeous pastel colors. 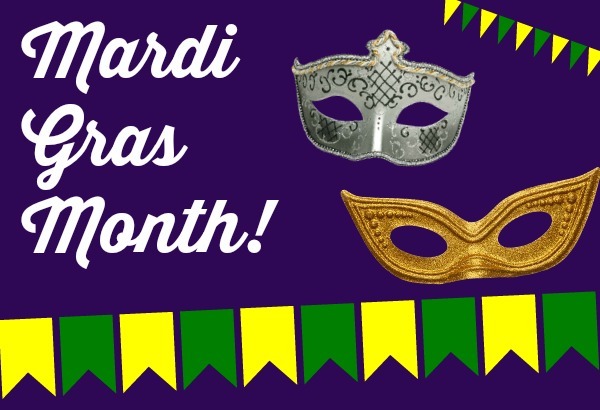 The color theme comes from the Mardi Gras holiday with purple symbolizing justice, gold for power and green for faith. I went a little crazy taking pictures of this dessert. It is just so pretty, I couldn't help it. I think it is a wonderful edition to my Mardi Gras collection of recipes here at the site. The reason there are some purple specs in my grape layer is that I didn't have the water quite hot enough so it didn't fully dissolve. Learn from my mistake! Regardless, I still think this dessert is gorgeous. Keep in mind that this dessert requires about 6 hours to chill and set up, so plan ahead. I prepared the Jello mold the day prior so it had plenty of time to set up. Notes: The original recipe from Kraft called for 2 boxes each of the lemon and lime flavors. I used 1 box each (a total accident on my part) and it turned out perfect. It is up to you if you want to use one box or two. Either way, the remaining ingredient amounts and directions remain the same. For the grape layer: Add 3/4 cup boiling water to grape gelatin mix in a medium bowl; stir 2 minutes until completely dissolved. Refrigerate for 20 minutes to cool. Whisk in 1/2 cup sour cream. Skim off as many bubbles as you are able to before pouring into a bundt pan. Skim off any remaining bubbles, especially around the outside edges of the pan. Refrigerate 30 minutes until thickened but not set. For the lemon layer: Meanwhile, add 1 1/2 cups boiling water to lemon gelatin mix; stir 2 minutes until completely dissolved. Chill 25 minutes to cool. Whisk in 1 cup sour cream. Skim off any bubbles the same way as directed previously. Gently spoon or pour over the grape layer in the mold. Chill 30 minutes, until thickened but not set. For the lime layer: Add 1 1/2 cups boiling water to lime gelatin mix; stir 2 minutes, until completely dissolved. Chill 25 minutes. Whisk in 1 cup sour cream. Skim off any bubbles the same way as directed previously. Gently spoon or pour over lemon layer in mold. Refrigerate 6 hours, until firm. When ready to serve, fill your sink halfway with hot water. Set the bundt pan in the water for about 5 seconds and remove. Put your serving plate upside down over the top of the bundt pan. Clamp it tightly over the pan with both hands and flip. The jello mold should release from the pan and be right side up on your serving dish. Cut into slices and serve. Recipe by Jam Hands, adapted from Kraft. That did turn out pretty and perfect for Mardi Gras! I need to find a jello mold so I can make this!